Illinois University scientists have successfully converted wet biowaste into a fuel that can be blended with diesel. The new fuel is said to shares diesel’s combustion efficiency and emissions profile. “The demonstration that fuels produced from wet waste can be used in engines is a huge step forward for the development of sustainable liquid fuels,” said research scientist Brajendra K. Sharma. 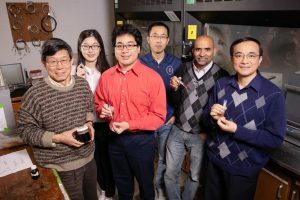 Sharma is a co-author of the study along with first author and professor Wan-Ting Chen, who were led by Illinois agricultural and biological engineering professor Yuanhui Zhang. Mechanical science and engineering professor Chia-Fon Lee and graduate student Timothy Lee led the engine tests. According to the researchers, the U.S. annually produces 79 million dry tons of wet biowaste from food processing and animal production – with more expected as urbanization increases. One of the biggest hurdles to extracting energy from this waste is its water content. Drying it requires almost as much energy as can be extracted from it. One potential solution is Hydrothermal Liquification (HTL). It uses water as the reaction medium and converts even nonlipid (non-fatty) biowaste components into biocrude oil. According to the researchers, it can be further processed into engine fuels. Previous studies have stumbled in trying to distill the biocrude generated through HTL into stable, usable fuels. For the new research, the team combined distillation with a process called ‘Esterification’ to convert the most promising fractions of distilled biocrude into a liquid fuel that can be blended with diesel. The researchers say that their new fuel has met all current standards and specifications prescribed for diesel fuel. The team is currently building a pilot-scale reactor that can be mounted on a mobile trailer. It can process one ton of biowaste and produce 30 gallons of biocrude oil per day.